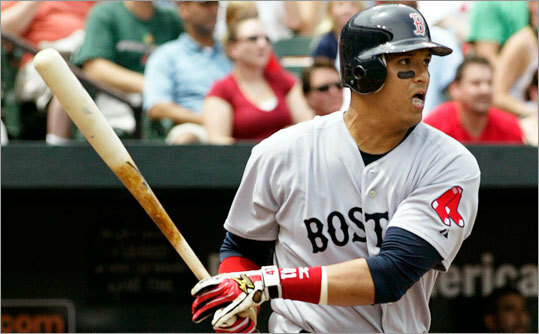 (Reuters) Victor Martinez registered five hits and drove in four runs for the Sox. BALTIMORE - Change rocked Victor Martinez this weekend. One day, he showed up to play for a team near the bottom of the standings, surrounded by beloved teammates, imbued with the comfort and monotony of routine. He was told he had a new employer, a new home, new teammates. He stood in front of his locker and sobbed. The next day, he showed up to play for a team fighting for first place. His sadness ceded first to nerves and, yesterday, delight. “It’s not the same when you’re playing and you fall way back in the standings like we were,’’ Martinez said. Martinez found a new energy with the Red Sox. And with that, Martinez proved, in yesterday’s 18-10 trouncing of the Baltimore Orioles, that he could change the Red Sox as much as they changed him. In his second game with the team and first as a catcher, Martinez went 5 for 6 with a double and four RBIs, exactly the performance the Sox hoped for when they dropped him in the middle of their lineup. The Red Sox knew their offense was better than the slumping unit that scuffled out of the All-Star break. But they also knew the importance of adding one more bat, and how a powerful switch-hitter and constant danger such as Martinez could enhance the entire lineup. “Immediate impact,’’ manager Terry Francona said. “I think you’re seeing one of the better hitters in the league, with some renewed excitement. He’s nervous, and hopefully, because of that, maybe we’ll see the best of him. His swings have been phenomenal. It helped also that the Sox faced the Orioles. The Red Sox tenderized six pitchers, produced 30 base runners, and scored runs in seven innings. The game lasted 3 hours 46 minutes, which is awfully long for a comedy. The Orioles have become more foil than opponent for the Red Sox. The Sox are 11-2 this season against Baltimore and 50-17 since 2006, a .746 winning percentage. Things get tougher from here for the Red Sox, and not just because they could scarcely get easier. This week, after a day off today, they face six games against the Tampa Bay Rays and New York Yankees, the division rivals against whom they’re competing for two playoff spots. Before that gauntlet, they got to play the Orioles, a trip to a day spa before an important exam. You could choose a Red Sox hitter at random and he would be worthy of merit - only David Ortiz went hitless among the starters. But a few earned special distinction. Kevin Youkilis went 3 for 4 with two walks, a standout day without the context. By walking to force home a run in the sixth, Youkilis had reached base in 13 consecutive plate appearances. He snapped his streak in his final at-bat by striking out. Mike Lowell went 3 for 5 and, although the Sox walloped 23 hits, Lowell delivered perhaps the most essential. In the third inning, the Orioles turned a 7-0 blowout into a 7-6 squeaker. The Sox answered by loading the bases with one out for Lowell. He hooked a double to left off Matt Albers, scoring two runs. ■ The Red Sox put eight runners in scoring position before the Orioles managed their first hit. ■ The Red Sox had 16 hits and five walks after the fourth inning, 21 base runners using 12 outs. ■ J.D. Drew played a half-inning and drove in three runs. Not every aspect was so lighthearted. Starter Clay Buchholz, even pitching with a seven-run lead, inspired some doubt about his efficacy as a permanent fixture in the rotation. Buchholz yielded six runs in the third, the biggest blow a two-run missile of a homer by Ty Wigginton off the left-field foul pole. Buchholz peppered the meat of the strike zone, allowing nine hits in four innings plus. For yesterday, though, Buchholz’s struggles were a minor impediment. The offense made sure of that, Martinez more than anyone.